Having released numerous world-premiere recordings of Hans Gál’s symphonic, concertante and solo works to critical acclaim, Avie turns to the composer’s chamber music, specifically the two works he wrote for string trio. Performed by Ensemble Epomeo, the world-premiere recordings of Gál’s Serenade for String Trio, Op. 41 and Trio, Op. 104, are paired with works by Gál’s contemporary Hans Krása, Tanec and Passacaglia and Fugue. The Austrian-born Gál and Czech-born Krása shared a Jewish heritage, but whereas Gál escaped Nazi oppression, Krása was interred in Theresienstadt where he was instrumental in organizing the cultural life of the concentration camp, then sent to Auschwitz where he perished in 1944. Tanec and Passacaglia and Fugue were written in the last year of his life. Founded in 2008 on the slopes of Mount Epomeo at the Festivale di Musica da Camera d’Ischia in Italy, Ensemble Epomeo consists of three virtuosi dedicated to the expansion of the string trio repertoire and exciting, innovative and engaging approaches to performance. 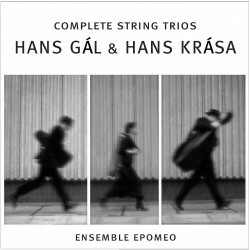 Anchored by cellist Kenneth Woods who as conductor has brought a highly-acclaimed series of Hans Gál symphonies to the label, Ensemble Epomeo are quickly becoming a favourite at international music festivals on both sides of the Atlantic. This release marks their commercial recording debut.